Thanks for taking a moment visiting this site! Here youll find guaranteed computer tutorials completely free for you with simple step by step procedures to help you learn and visualize your work with confidence. My goal is to give you a solid foundation. Do you have questions that need answers? Computer basics is a great place to start. I will teach you basic computer skills as well as how to build, upgrade, maintain, and repair computer systems. Do not feel frustrated if your computer isnt working the way you want. Find the information that you're looking for and gain the skills you need to keep your computer running at its best. PCs break all the time. that is a fact. Perhaps you wish there was a magic button that you could press and fix everything. Allthough I can't tell you that a button will fix your computer, I can however promise that by investing a little bit of your time reading and learning these computer tutorials, you can fix those frustrating every day computer problems. 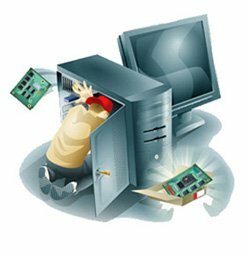 You will discover that most computer-problems can be fixed quite easily if you keep simple maintenance on your PC, and if you understand how they work. So jump in and begin checking these computer tutorials website. This site is tailored to everyone with a desire to learn. That is your first step. I will show you ways to keep your computer up and running just the way it should be. From now on, the next time you find yourself with a computer problem, just relax, take a deep breath, and check out this web site. You will find the solution here. Computer basics are essential when trying to repair and maintain computers. These tutorials will introduce you to basic knowledge to start building on your computer skills. This free computer help page has articles with visual aid to show you anything there is to know about computers every step of the way. These basic computer troubleshooting techniques will help you fix your computer problems and it will help you save time and money. Learn computer definitions: disk cleanup, disk defragmenter, computer virus. These and much more are answered here for you. Many people know how to use computers, but not many people know how to maintain and fix them. This site will show you ways to save time and money fixing your computer. Computer is slow? Learn how to fix that. Need to restore your PC? Run system restore. Need to troubleshoot? Learn how here.